AirAsia Indonesia (Indonesia AirAsia) (Jakarta) missing flight QZ 8501 remains missing as far as the main portion of Airbus A320-216 PK-AXC (msn 3648). 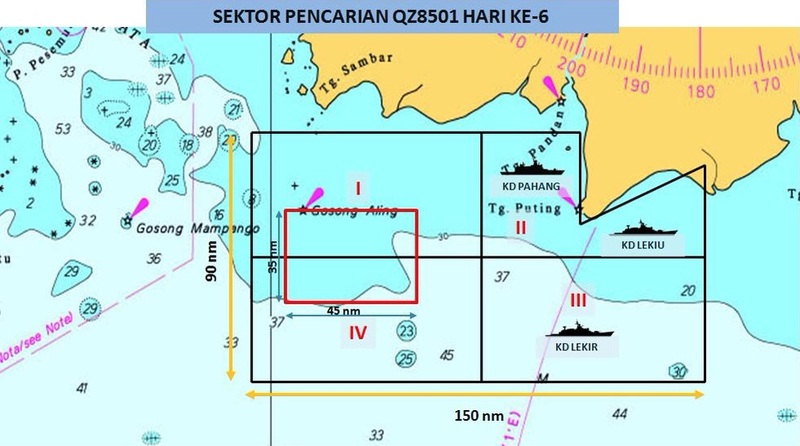 However two large objects have been detected with sonar equipment on the floor of the Java Sea. One object was 31 feet by 15 feet and 20 inches high. 30 bodies have now recovered. Meanwhile, the Transport Ministry of Indonesia claims AirAsia Indonesia was not authorized to fly the Surabaya-Singapore route. AirAsia Indonesia has stopped flying the route as the investigation continues. The Disaster Victim Identification Police Department of Republic of Indonesia (DVI POLRI) today confirmed that the remains of three more passengers on board QZ 8501 were identified as Grayson Herbert Linaksita (male), Khairunisa Haidar Fauzi (female), and Kevin Alexander Sutjipto (male). Khairunisa Haidar Fauzi was one of the flight attendants on board QZ 8501, and has been with AirAsia Indonesia since January 28, 2013. Khairunisa was well known for her professionalism as well as dedication at work. This entry was posted in AirAsia (Indonesia) and tagged A320, AirAsia, AirAsia (Indonesia), AirAsia Berhad, AirAsia flight 8501, AirAsia flight QZ 8501, Airbus, Airbus A320, latest news on AirAsia flight QZ 8501, missing AirAsia Indonesia flight 8501, missing flight 8501, QZ 8501 on January 3, 2015 by Bruce Drum.